Factory trained technicians utilize precision equipment for precise results. Trained chemists are always on hand, to accommodate any special requests or needs. 30 years of precise, honest, and reliable service for the precious metal industry. How does the precious metal refinery you’re currently working with stack up? What makes Federal Refining different from the rest? 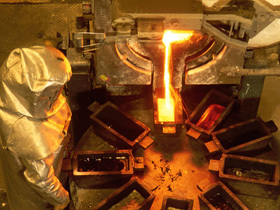 Although many are quick to call themselves a precious metal refinery, the truth of the matter is that it takes a lot more than simply having both a furnace and digital scale to actually be a reputable precious metal refinery. In fact, the attributing factors that have led to the success of our company include our many years of experience in the industry, our arsenal of precision equipment and, also, our loyal and dedicated staff who is trained and ready to ensure that the job gets done properly each time, every time. Ongoing advances in technology have made it easier to assay precious metals, but only if you have the right tools! The technology predominantly used today is X-ray fluorescence (XRF). Unfortunately, the equipment used in the XRF process has many limitations and suffers pitfalls resulting in margins of error as high as 3%! Fortunately, the advanced equipment and techniques used at Federal Refining ensures extremely greater precision with each lot as compared to lots settled out by the more standardly found XRF options provided by many of our competitors. At Federal Refining, rather than using X-ray equipment to settle lots, we instead utilize an age-old method called fire assay. 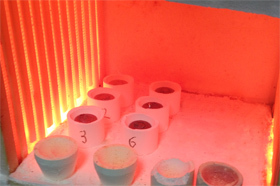 A fire assay provides 99.9% accuracy. The price for this accuracy is the time that the process requires, as it does take anywhere from 3-5 hours to perform! That said, it is known in the industry as the most respected and trusted way to achieve a proper and precise precious metal assay each and every time. And, what’s more is that, while most others are set up to work on your precious metals behind closed doors, we not only invite you to come and witness your lot being melted, we encourage it! We have instituted an “open door” policy with each of the businesses we are fortunate to work with, asking them to consider witnessing a melt as it is taking place! We hope that you will feel inspired to give us a call today to discuss how our business can be of assistance to your business, or send us a message by way of our contact form so that we can respond and possibly show you a way that we can help your business actually make more money. Looking to invest in Silver, Gold, Platinum or Palladium bullion? We stock a vast number of both house-minted & reputable refinery branded bullion to meet everyone’s needs and budgets. We also produce .999 fine grain Silver & Gold for jewelry manufacturers, the aerospace and the electronics industry. Being a full fledged precious metal refinery, we also have the capabilities to custom tailor our products to your exact specifications and needs. Best yet, when you deal directly with Federal Refining, you’ve essentially cut out all the middle-men. You can rest assure you’ll always get the absolute best price and the highest level of customer service! Gold melts at 1064 degrees centigrade. Fort Knox holds 4,600 tons of gold. It is rarer to find a 1oz nugget of gold than a 5ct diamond. 60% of the gold mined today becomes jewellery. 31.103, the number of grams in a troy ounce of gold. Over 90 percent of the world’s gold has been mined since the California Gold Rush. Which way is Gold going? Federal’s newsletter is sent periodically and will keep you updated with new services, and industry related information. © 2012 Federal Refining, Inc. All right are reserved.